We Americans are in a pessimistic state these days. Many of us feel the country is headed in the wrong direction, and a lot of that feeling is related to the economy. Many say we just don’t have the money to take care of all the needs before us. We need to trim our sails and harbor our resources, they say; recognize our limitations; spend less on domestic indulgences and foreign wars and offering bailouts to people and businesses in financial trouble. We just don’t have enough to meet everyone’s need. My small circle of acquaintances and I don’t have a clue about what technical solutions may fix the mess we’re in, and everyone seems to have a different opinion about the presidential candidates who are promising to offer a fix. But we all have first-hand knowledge of the pessimism that can grow when the need around us outstrips our resources, and I’m not talking only about the bills that are left to pay when the balance in our checking account trends toward nil. I’m not even talking about the state of our society, which has produced yet one more deranged shooting. What about when you’re waiting in the receiving line at a funeral home, like many of us will be tomorrow evening, and finally come face to face with the father whose wife and the children whose mother lost her battle with cancer last week? What do any of us have to say that will meet that family’s need? What do you offer at the kitchen table to a friend who has just lost her job, or to the two friends and parents of young children who are going through a difficult divorce? What do you say to your sister who is raising her granddaughter and caring for a special-needs daughter of her own and struggling to keep her own head above water? What resources could you possibly have that are big enough to meet such a need? Well, you don’t have resources big enough for needs like that. None of us do. We have at best a few resources that are matched by weakness and ineffectiveness and an overwhelming sense of our own incapacity. Well, we do have one thing more. We have God. In our fragile and fallible weakness we have the extraordinary, transcendent power of the divine (2 Cor. 4:7). We have a God who “can do anything . . . far more than you could ever imagine or guess or request in your wildest dreams” and who does it “by working deeply and gently within us” (Eph. 3:20 The Message). God does extraordinary things through ordinary people like you and me. Or I might better say, God does it with ordinary people like us. As one who has received visitors at a funeral home, I don’t remember anything anyone said to me. What I remember is that they came. None of their fumbling or graceful attempts to offer the right words spoke as eloquently or was as healing as their offering of themselves, even in awkward silence. They just came, and God did the rest. It’s enough for us simply to come and face dumbfounded the overwhelming need before us and let God do the rest. 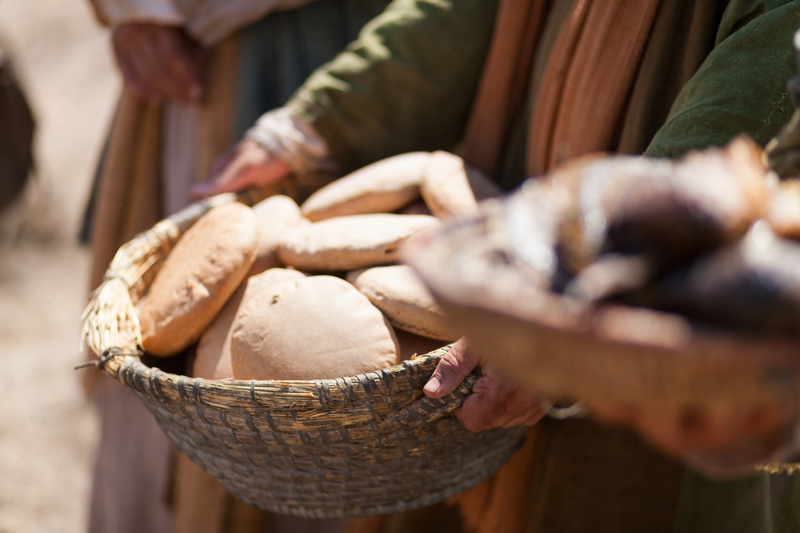 It’s enough simply to come and place our little lunch of loaves and fish in the hands of a generous God. Take our neighbors on Buffalo’s West Side, for example, people who have taken as hard a blow as any in this economy. One of their chronic needs is access to nutritious, healthy food, yet stores that carry such food are often too far away to be accessible. And such food, when it can be found, is too high-priced to be affordable, leaving them to rely on junk food and fast food that increases obesity and malnutrition. How can any of us respond in a meaningful way to such overwhelming need? We might be tempted to throw up our hands and, like Philip, complain, “It would take a small fortune to feed them” (John 6:7 NLT)! Well, we do it one person and one small gesture at a time. On the West Side a little group called the Massachusetts Avenue Project is teaching teenagers about nutrition and how to run a business. Young people are learning how to grow nutritious food, how to cook with it, and how to develop marketable products with the food they grow. And they’re making a difference, raising hope, developing young people, and revitalizing neighborhoods. They’re not doing it all; they’re simply offering the best they have into the hands of a generous God, and people are being fed, and needs are being met. I don’t know what happened with that boy’s lunch of loaves and fish that day when Jesus and his disciples were surrounded by the hungry crowd. Did his gesture of generosity inspire others to share the food they brought with them that day, so that a contagious generosity produced more than enough to meet everyone’s needs? I don’t know. I know only that when we make ourselves available and offer into God’s hands whatever little gift we have – a little money, a little time, a little talent – God does with it more than you can ever imagine.